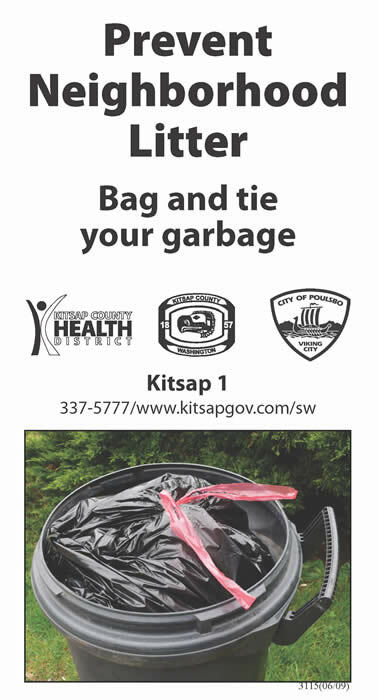 The Solid Waste Division provides garbage and recycling services for over 3,725 single and multi-family units as well as trash removal for businesses within the city limits of Poulsbo. The Solid Waste Division takes pride in its commitment to the environment. Services and programs are designed to meet the garbage and recycling needs of Poulsbo residents and businesses thus helping to protect our natural resources. Inquiries should be directed to Public Works, (360) 779-4078. The City operates its own garbage service utility. If you occasionally have extra garbage, prepaid tags can be purchased at City Hall, one tag per can, box or bag. Untagged extra garbage will not be collected. Please have can(s) out by 7:00 am: Collection times vary as routing schedules change, so it is very important to have all containers at the street by 7:00 am. All garbage must fit inside the can with the lid closed. Placement is important as the truck’s mechanical arm needs unobstructed access to your can. Trucks with robotic arms will lift, empty and replace the can without the driver leaving the truck, reducing safety hazards and traffic congestion. If your can was at the curb by 7:00 am and missed, please call 360-779-4078. If the roads are icy and unsafe for trucks to navigate, Public Works may not be able to cover all routes, especially in hilly areas. If your pickup is missed for garbage and recycling due to bad weather, you should take materials back in and a double load of garbage and recycling will be collected at no additional charge on the next regularly scheduled collection day (a week later). City of Poulsbo Public Works department collects garbage during ALL holidays including: Thanksgiving, Christmas and New Year’s Day. Bainbridge Disposal will also collect recycling during all holidays. There will be no change to your scheduled garbage pickup day during holidays. The initial cost includes placement, one dump and removal. After the first 7 days, a $10 weekly rental fee will be charged. Note the additional dump charge if you care to empty dumpster more than once. The City provides a curb side recycling program through Bainbridge Disposal. Recyclables are collected every other week on your assigned garbage pickup day. A 64-gallon container will be supplied for recycling and will be picked up by Bainbridge Disposal. Bainbridge Disposal also offers yard waste recycling service for an additional fee. Please call (206) 842-4882 with questions, or to set up this service. What can I put in my yard waste bin? What can I put in my recycle bin?